An unaltered photocopy of your DD-214, WD AGO or NGB-22. 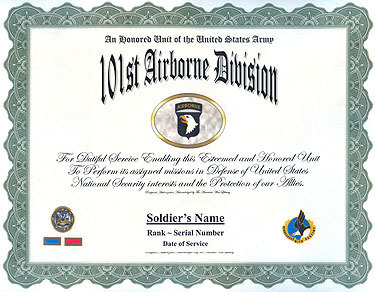 If your service with the 101st is not displayed on your DD-214 you must provide a copy of your DD-214 -AND- a copy(s) of any military-issued clearly displaying your service with the 101st Airborne Division. The 101st Airborne Division (Air Assault) is an air assault division of the United States Army. Nicknamed the Screaming Eagles, the 101st has consistently distinguished itself by demonstrating the highest standards of military professionalism since its activation on Aug. 15, 1942. On Aug. 19 of that year, the first commander, Maj. Gen. William C. Lee, promised his new recruits that although the new division had no history, it would soon have a rendezvous with destiny. As a division, the 101st has never failed that prophecy. Before the end of World War II, the 20th Armored Division converted to a combat division, completed its training and deployed overseas to fight as a combat unit in Europe. All totaled, Camp Campbell trained and deployed more than one quarter of all armored Soldiers who fought in the Armys armored divisions. The 101st had many successes during World War II. They led the way on D-Day in the night drop prior to the invasion and during the Battle of the Bulge, when the 101st was surrounded at Bastogne and ordered to surrender to the German army, Brig. Gen. Anthony McAuliffe famously replied, To the German commander: Nuts!-The American commander, and the Screaming Eagles fought on until the siege was lifted. One unusual mission performed at Camp Campbell during the war years was that of providing a prisoner of war camp. Victory in North Africa in 1942 netted an unplanned capture of a quarter of a million German soldiers, mostly from the famed Africa-Corps. Prisoners here were segregated between three stockades by rank and by Nazi vs. Anti-Nazi sympathies. Many German officers and NCOs were utilized in post support details, while many of the enlisted German soldiers were available for hire on a daily basis to local farmers and dairies. A small POW cemetery located in the southeast corner of the former Clarksville Base stands as a reminder of this era. For their valiant efforts and heroic deeds during World War II, the 101st Airborne Division was awarded four campaign streamers and two Presidential Unit Citations. However, victory in 1945 led to the inevitable demobilization of the 8 million-man force and it appeared the fate of Camp Campbell, like so many of other wartime contingency mobilization and training camps, was to close and be consigned to the memory of history. International tension between the United States and the Soviet Union, what became known as the Cold War, intervened in the expected fate of Camp Campbell. Location, transportation, infrastructure, and the existence of a large airfield made the location ideal for one of the nations top-secret nuclear weapons storage and modification facilities. As if by coincidence, the 11th Airborne Division, then an occupation force in Japan, was transferred to take permanent occupation of the camp. They arrived in May 1949. To recognize the now permanent status of the camp, on April 15, 1950 Camp Campbell was officially changed to Fort Campbell. Combat Team fought valorously in Korea and participated in the only two combat parachute assaults of the war. 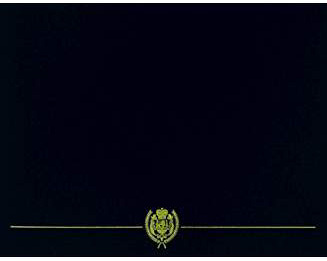 1962 and 1964, the Army scrapped the pentomic concept and opted to the change to a brigade structure. The new structure, based on three infantry battalions per brigade, provided for strategically deployable separate brigades, to defend U.S. interests worldwide. The first test of this concept came in 1965. December 1967, the remainder of the 101st Airborne Division was deployed to Vietnam, leaving Fort Campbell empty of a combat division. During the absence of the 101st Airborne Division from 1967 to 1972, Fort Campbell became the home of the United States Army Training Center. More than 240,000 entry-level Soldiers received basic and advanced infantry training at Fort Campbell before receiving assignments around the world as individual replacements. Additionally, the 6th Infantry Division-a specially trained unit formed to provide assistance with civil disturbances-was also activated and stationed at Fort Campbell during these years. The end of the Vietnam War did not assure the return of the 101st to Fort Campbell. While in Vietnam, the division organization changed dramatically, from an Airborne organization to an Airmobile organization. Hundreds of helicopters and warrant officers had been added to the division, requiring extensive airfield and the need for additional officers quarters throughout the installation. Sometime after the Vietnam War was over, the division switched its designation from Airmobile to Air Assault. This change reflected the changing mission of the division, from guerrilla war in Southeast Asia to high intensity combat on the battlefields of Europe, or anywhere else. Operation Desert Shield/Desert Storm, the deepest combat air assault into enemy territory in the history of the world. Miraculously, the 101st sustained no Soldiers killed in action and captured thousands of enemy prisoners during the 100-hour war. In addition to major operations, Fort Campbell Soldiers have also supported humanitarian relief efforts in Rwanda and Somalia, and supplied peacekeepers to Bosnia, Haiti and Kosovo. The United States was called to war after the Sept. 11, 2001 terrorist attacks on the World Trade Center and the Pentagon. The Soldiers of the 101st Airborne Division answered the call. The division deployed the 3rd Brigade to Afghanistan in support of Operation Enduring Freedom. Their mission was to root out both the Taliban and al-Qaeda, Osama bin Ladens network of terror. The brigade distinguished itself by swiftly toppling the Taliban and freeing the Afghans from tyranny-a feat never before accomplished in Afghan history. In March 2003, the 101st continued to fight the global war on terror with a deployment to Iraq, this time in support of Operation Iraqi Freedom. The division stood out not only during the war against Iraqi dictator Saddam Hussein, but even more so after the war when the division quickly converted from a fighting ethos into a successful humanitarian program in Mosul, Iraq. Upon returning from Iraq in 2004, the division swiftly changed gears and became one of the first divisions to implement Army transformation. The 101st Airborne Division was called back to Iraq in August 2005.
mission remained the same-continue to train Iraqi security forces, extinguish insurgency, and establish democracy in Iraq. Since its inception in 1942, the 101st continues to demonstrate its hallmark professionalism, which distinguished the mighty division from other fighting units more than 60 years ago. Today it stands alone as the most powerful force of its kind-a capable deterrent to any force that poses a threat to the United States, always ready and willing to embark on its next rendezvous with destiny.